We have teamed up with Click&Go to offer you this amazing, bucket list exclusive offer. We are offering a 4* 3 night city break for two people to Krakow in Poland for 2 people. 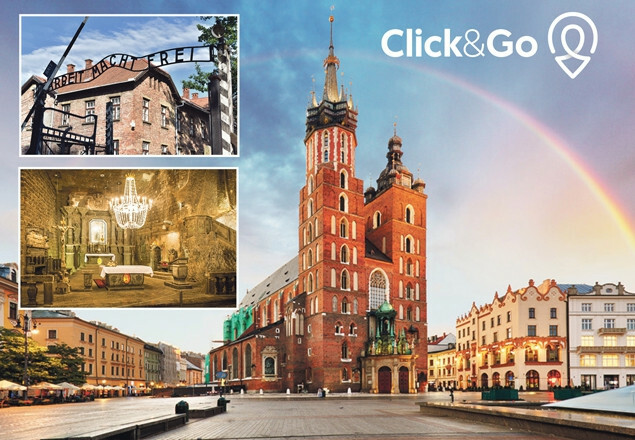 The offers includes return flights, return airport transfers, 3 nights 4* central hotel with breakfast each morning, a half day guided city tour on arrival and a full day tour to Auschwitz & Salt Mines with entrance fees and lunch included. When you visit the city you will find yourself going back into the past as it is one of very few cities in Poland that have preserved its historic shape. The city also offers a wide spectrum of festivals, cultural events, museums, art galleries, theatres, historic cellars, clubs, bars and restaurants with live music. It is an excellent destination for all the travellers. Highlights include: Szeroka Street where “Schindler’s List” was filmed, Isaac, High, and Old Synagogues, Remuh Synagogue and Cemetery, and the Pod Orłem (“Eagle”) Pharmacy. Experience one of the most memorable lessons of modern European history. You will see a film showing the camp’s liberation, the flower strewn Death Wall, national memorials, the railway line and ramp and the remains of hundreds of barracks, all of which form a moving testimony to the number of lost lives as a result of Nazi atrocities across occupied Europe. This incredible place was once described as being ‘as remarkable as the Pyramids and more useful’! Today it is a UNESCO World Heritage Site and one of the most famous attractions in the Kraków area. Guided tours of the mine commence 65m underground and lead through rooms, passages and great chambers to a depth of 135m. Major curiosities include the underground lake with its stunning colours and the beautiful St. Kinga’s Chapel, a remarkable underground ‘cathedral’ where every feature has been carved out of solid salt! There’s even an underground post office made out of salt, too! Qubus Hotel Kraków is located next to the beautiful old district of Kazimierz. The hotel has a Certificate of Excellence from Trip Advisor. Its Guests can enjoy comfortable rooms with free Internet access as well as a modern fitness centre with sauna, Jacuzzi and a glass swimming pool with the view on the Old Town.